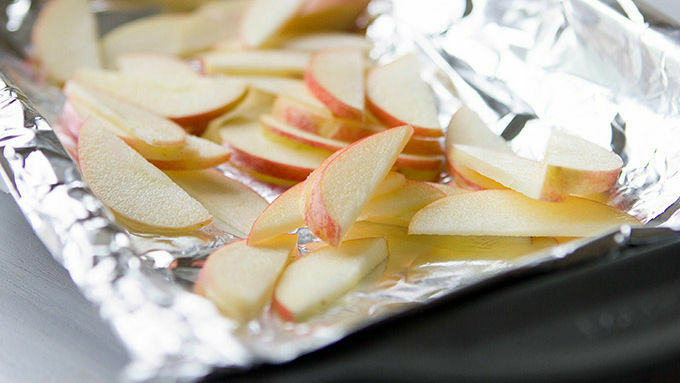 Place sliced apples in a parchment-lined 9x9-inch baking pan. Drizzle with 2 tablespoons melted butter and honey. Roast in preheated oven for 15-20 minutes, just until the apples become tender and the honey and butter begin to reduce and thicken. Preheat a panini grill or a grill pan over medium heat on the stove. Remove apples from oven. Drizzle remaining butter on two outer sides of the bread. Place bread (butter side down) on a clean cutting board. Spoon roasted apples on one side. Slather brie on the second side. 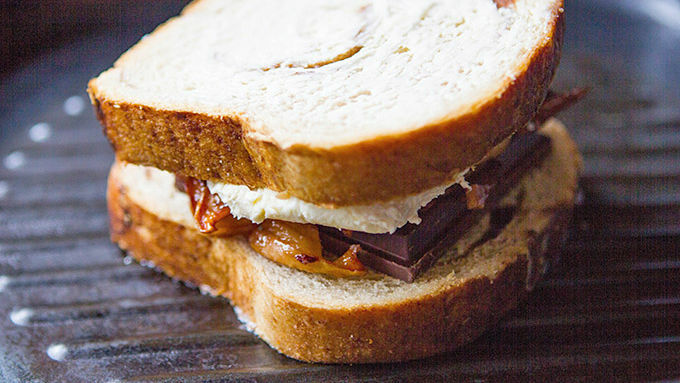 Place the candy bar on top of the brie. Press the sandwich gently together. Grill until golden brown on one side. Flip and grill on the second side until golden brown. Open your eyes – it's not a dream. This confection is yours. All yours. Okay, if I tell you something, promise you won’t snicker? This gorgeous little autumn-inspired sandwich has the following perfect flavors: Honey-roasted apples. Sea-salt caramel and dark chocolate. Cinnamon swirl bread. Yeah, I know. It sounds too good to be true. Around our parts, we just say it sounds too good not to eat. Get all of these gorgeous flavors. Welcome fall. 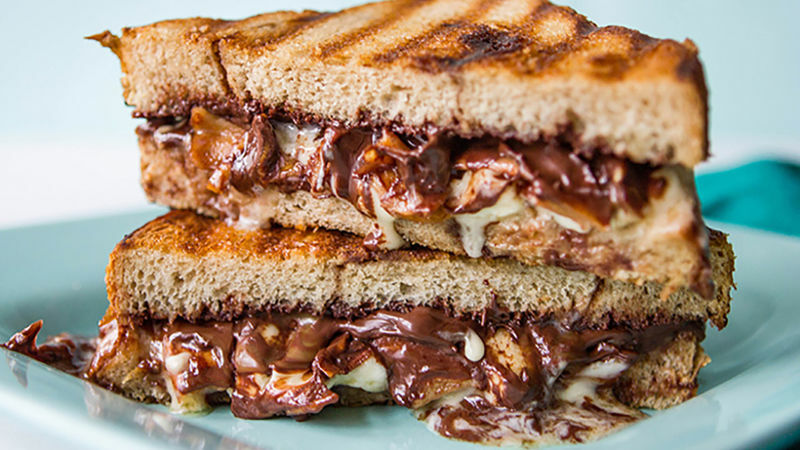 Turn your grilled cheese habit into this irresistible eat! Place on a panini grill or indoor grill to cook. And prepare your heart and soul for all the good parts of fall. 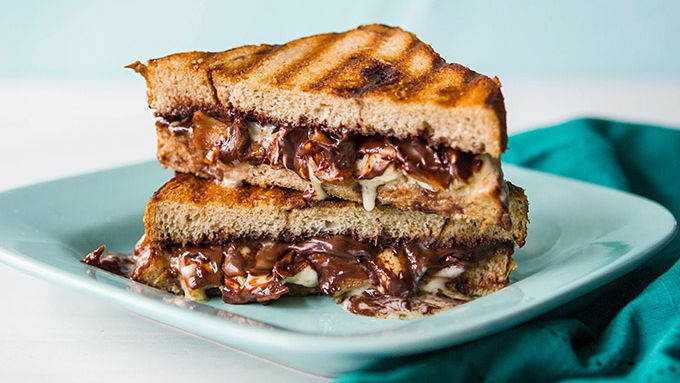 Which will now and forever include this amazingly melty and sinfully sweet treat. Happy, happy season's eatings!